I've hinted at this one and posted some unbuilt pics in the "what's in your stand" thread, but never did put a proper Custom Gallery post together on it.. I picked this one up from Dave in mid-2018, somewhere around the time I put my deposit down on my MRB, but before I knew when that was going to get built. I think Houston tipped me off to its potential availability. And Dave confirmed he did want to let it go eventually to make room for other projects. I have a hard time saying no to amazing bikes that fit me, so I went for it, even though I'd committed to buying Lionel's Stumpy S-Works a week earlier. After getting the frameset in hand, I decided to sell off the S-Works and build this one up instead. But with me not knowing my way around disc brake configurations, and being preoccupied with the road season still in full swing, I never got around to building it - or completing the build. I decided a couple weeks ago that enough was enough and took it in to Golden Pliers to get the rear brake hooked up, bled, and new pads put in (they'd gotten fouled somewhere along the way). I still haven't gotten it dirty. But it feels good on the trainer. I'm not sure how to dial in the stem length, setback, or bar width at this point. Everything feels a bit foreign. I think it's solidly within range though and I'm looking forward to getting it out on the trails soon. I still need to put fresh sealant in. And should probably get the fork freshened... MTBs are complicated! Last edited by Clean39T; 01-17-2019 at 01:28 AM. That is one nice Hardtail! Love the color and set up. Pretty much perfect. If I was getting a mountain bike built this would be it. Great looking bike and a hell of a way to get on to good trails. It's the kind of bike I'd love to put together at some point too. Hope you have fun with it. Yessir ! 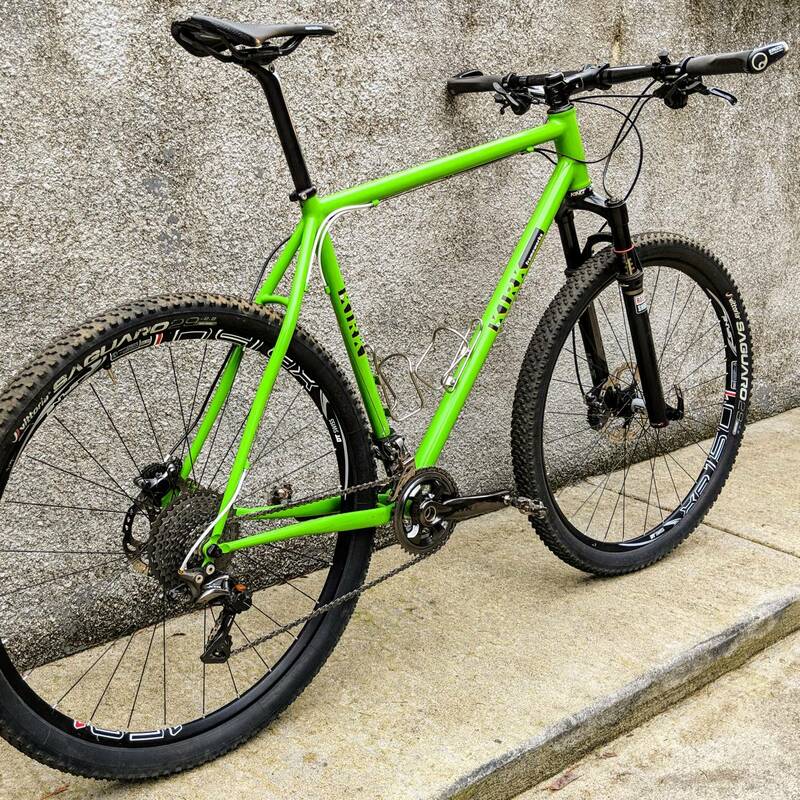 Love that color, also love the fact that it'd fit me (since I have virtually no grasp of MTB fit). 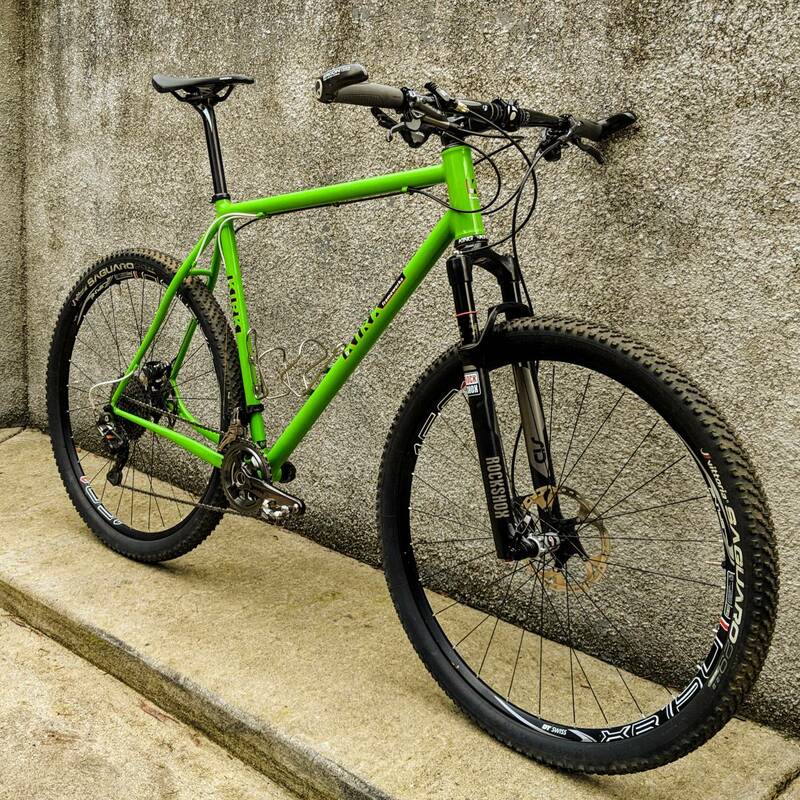 Begs the question, are terraplane seatstays an option on MTB frames? I don't see MTBs referenced on Dave's website. That is awesome. Love the color and bet it's going to be a blast to ride. For some reason I just figured you'd have plenty of cool local Portland/OR singletrack. But I like your attitude; thinking in terms of day trips or overnights and getting some special riding in seems like a good way to savor that bike. That is a nice one fur sur. I also like the color. What is the build? They are a nice change of pace to get off the roads once in a while. I just pick up a steel full rigid and did a some of the rail trails and fire roads in my area. We have a few inches of snow here so the fire roads dont see much foot or bike traffic and it is so nice and peaceful this time of year. Thanks, hoping I'll finally get it out this weekend for some fire-road action..
XTR everything - 11/36 and 28/38. DT Swiss Spline XR1501 - Vittoria Saguaro tires. Bontrager PRO Stem and Carbon Bars - Ergon Grips w Carbon Ends. Deda post and Bontrager Montrose Pro saddle. Haven't weighed it - guessing mid-twenties?